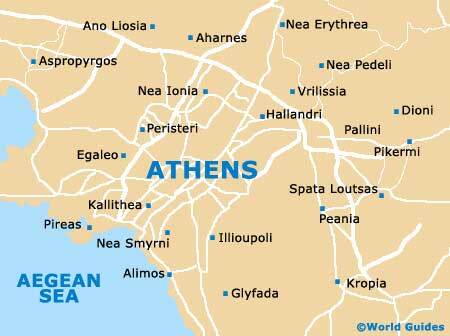 Athens, the capital city of Greece, is an ancient city, steeped in many centuries of history. It may not be the most attractive or appealing city in the world, but if you look just a little bit harder you will see the charming, exciting and vibrant city of Athens appear before your very eyes. Home of the Olympics, the original modern-day Olympic Games were held in the city of Athens over 100 years ago. In 2004, the Olympic Games finally returned here and the city underwent an enormous facelift when the announcement was first made. This included multi-million Euro projects, such as the new state-of-the-art Athens Airport, Olympic buildings and a large number of new trees and shrubs, planted to 'green up' this city. Athens also boasts a large parkland - created in 1839 for Queen Amalia to surround her royal palace, and many of the city's streets and squares are now planted with orange trees. Tourism is now an integral part of Athens and the Greek National Tourist Organisation has two official tourist information outlets in the city, located on the Syntagma area and at the arrivals hall of the airport. Worth picking up here is the free copy of the 'Athens and Attica' brochure, as well as public transport timetables and city maps. One of the best ways to enjoy this city in the summer is to follow the example of locals in Athens - get up early, have a busy morning (probably visiting some of the many superb sights), then enjoy a long, pleasant sleep through the heat of the day and live it up at night. Nightlife in Athens is excellent and there are many superb restaurants, cafés, bars and entertainment in and around the centre. Plaka is the old town of Athens and has been populated for over 5,000 years. Situated on the north and east slopes of the Acropolis, it is rich with historic sites, such as ancient monuments and churches, and Plaka is well worth exploring. 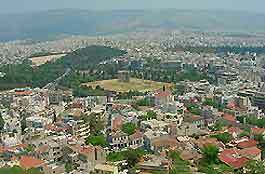 Within Athens there are eight large hills, including the Acropolis, and on the outskirts, Mount Parnitha, Mount Pendeli and Mount Hymettos surround the city. A trip to the Greek capital's most famous tourist attraction, the impressive Parthenon, built on the Acropolis around 2,500 years ago, will be memorable to say the least. 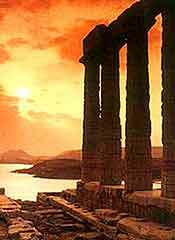 There are an extraordinary number of historic tourist sights in Athens and many of these are known world-wide. Some of the top places of interest include the Agora - a grand, ruined Roman building that was funded by Roman emperors; the Temple of Zeus - built around 1,500 years ago for the worship of the Greek God Zeus; Hadrian's Arch - originally the city gate linking the Roman quarters with the original town of Athens; and the stunning Dionysos Theatre - the world's oldest theatre where many great plays have been performed over the years. There is also plenty of historic information about Athens for tourists when visiting the city's world-class museums, and the best of these cultural offerings include the wonderful National Historical Museum - with collections of objects that illuminate the history of Greece; the National Archaeological Museum - with superb statues and vases; and the National Art Gallery, featuring many great works of art. Athens opened its new Metro subway system in January 2000, with the main station in Syntagma Square. This Metro system now provides a quick and easy way to travel around the city. Piraeus, one of the last old-style Mediterranean ports, still retains a friendly atmosphere, and from here you can catch ferries to all of the Greek islands and also some international destinations. Near to the port are some excellent beaches with good facilities. This epic city is where many historic and legendary Greek events actually once took place, literally centuries ago. Athens is a unique blend of Middle Eastern and Western cultures, and with some 40 percent of Greece's population living here, this capital has all the attractions of a big city and much more besides.